When Alex and I first started hunting for meat seriously we were very limited in the amount of meat we could bring home. We had Ice Boxes that could take quartered animals. These did a good enough job but I wanted something better. I prefer to hang my meat with the skin still on. I wanted to be able to take home whole deer. 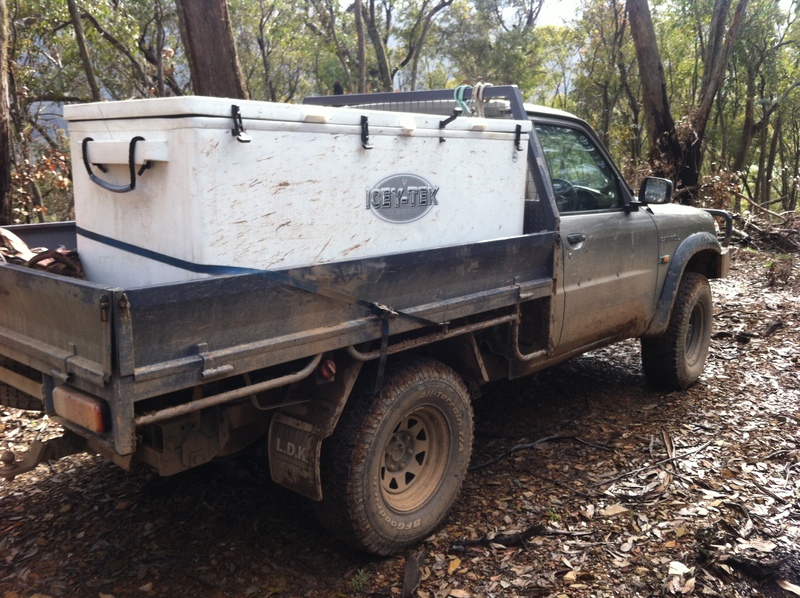 With a mate setting up a walk in cool room it was time to rethink our meat transportation. I bought a 600l Icey Tek chest. This is one big box. I could probably use it as a boat if I was caught in a flood. A box of this size enabled us to take home animals as big as Sambar or Red stags and multiple animals like Rusa and Fallow deer. On the fishing side it can handle big fish like Marlin and Tuna. The box was designed for the Hawaiian tuna boats. Once we have gutted the animal and hung it in camp it is cool enough to go in the box. We layer the bottom of the chest with bags of ice or frozen bottles of water. A layer of foam is placed over the ice then the carcasses are placed in the chest. We place the carcass with the gut cavity facing down. This ensures any fluid which hasn’t drained yet can. We are trying to keep the meat dry. Bacteria grows quickly with poor handling, temperature and moisture. If you don’t have the luxury of a big box it is easy to quarter the animal and then pack it in a similar fashion. If leaving the skin on pack it so no exposed meat is touching skin. Once everything is packed in we are good to hit the road home. I have kept deer cool for days when stored like this. You need to make sure you have sufficient ice at all times. Boxes made by Icey Tek do hold temperature very efficiently. Use a quality Ice Chest. Make sure carcasses are cool before placing them in the box. This ensures you get the most out of your ice. Hang the deer as long as possible before placing them in the chest. This is to drain as much blood as possible. Time hanging in camp will depend on variables like temperature and flies. Pack the deer with chest cavities facing down. If quartering the animal don’t let any fur touch exposed meat. Keep an eye on the ice if you have a long trip home or the deer will be in the chest for a few days. This entry was posted on April 21, 2013 by gourmetandy in Tips and tricks and tagged australia, box, butchery, esky, free, gourmet, hunters, hunting, hunting tips, ice chest, meat, range, sustainability, sustainable.